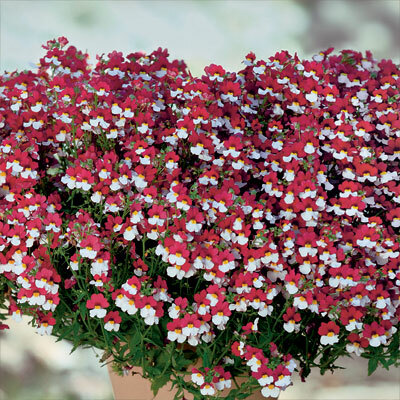 Flower colour of ‘Cherry on Ice’ is dramatic with its bright red and a lip of white, a truly outstanding addition to the Sunsatia family. Sunsatia Nemesias were introduced to the Australia and New Zealand several years ago and created an immediate hit in the marketplace. ‘Cherry on Ice’ is being introduced in all states and in New Zealand from July onwards into spring. The growth characteristics are similar to previous selections but added is the outstanding flower colour and long flowering of this selection. All Sunsatias in the Aussie Winners programme are from the breeding of Innovaplant in Germany. ‘Cherry on Ice’ is the latest selection to hit the market. Breeders are continuing their work in breeding and selection and several new types released since the introduction of this series have lifted the overall quality so that the plants of today are much better than the original introductions. As a plant which gives colour to your garden or patio for several months of the year all of the current ‘Sunsatias are well worthwhile. ‘Cherry on Ice’ is outstanding in its great colour contrasts. The bright red and pure white flowers are a great combination. Choose the best position for your plant in good light, full sun is preferred. Sunsatias grow best in full sun or partial shade, but need protection from midday sun and hot winds. Keep the soil or compost moist. That being said one must have good drainage. Light applications of liquid fertiliser at two week intervals are beneficial. To prolong flowering trim back the foliage and old flower heads after the flush. This will help retain maximum vigour and keep the plant blooming for longer. These plants are a breeding breakthrough. They are long lasting annuals, but may overwinter in some locations. They are not frost tolerant. We have seen little insect damage and other diseases are minimal.